Saint Louis, December 5, 2011 – The CCSCSL Invitational wrapped up Friday night with a lot of exciting games. 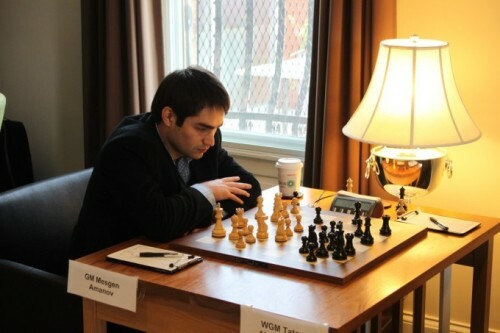 I was wondering two things went I went to sleep Thursday: Would GM Georgi Kacheishvili continue his blistering pace? And would IM Angelo Young be able to tighten up and avoid a clean sweep? 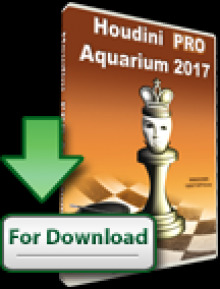 The amazing run by Kacheishvili continued until the end, as he won a complicated struggle against GM Andre Diamant and finished with an amazing 8-1 to win the event easily. Young had a fine last day, with a solid draw against IM Greg Shahade and another draw with IM Irina Krush, where Angelo was clearly pressing. 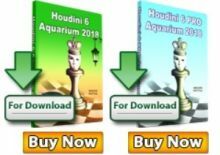 In somewhat unusual fashion, the three GMs took the top three places on the crosstable with GMs Mesgen Amanov and Diamant tied for 2nd place with 6-3. Kacheishvili was simply awesome. He was not lucky at all, simply outplaying everyone to demonstrate he was the clear deserving winner. Amanov played solid chess and was undefeated with two wins and seven draws, very Finegoldesque. Diamant started on fire with 3 out of 3, then went into drawing mode, as he could not keep up with the amazing Georgi! Three players scored +1. IM Marc Arnold played solidly for the most part,but was never really in the norm hunt. Darwin Yang, 14, played well, and only lost one game in this tough field. Certainly Darwin has a bright future on the American chess scene, and I expect he will play in many U.S. Championships, and represent the U.S. in International competition in the not-too-distant future. Irina Krush started well (even drawing an exciting game with the seemingly unstoppable Kacheishvili), and needed 3 out of 4 for a GM norm, but a tough loss to Greg Shahade with a time-trouble error dashed her hopes. 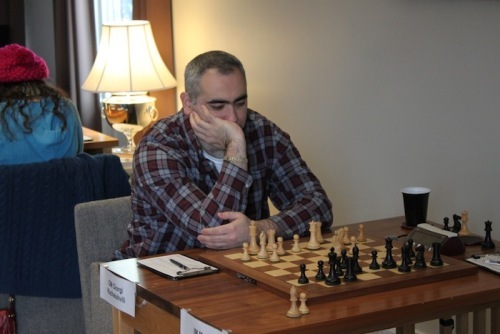 Shahade is back after a long hiatus from tournament chess, and he played well. He was the only player to score 50%, and he seemed reasonably happy with his effort. IM Danny Rensch started quite badly, losing his first five games, but he finished well to score 2.5. This was not his best effort, but Rensch plays a sharp enterprising style, and his games are always exciting and fun to watch. Young clearly was not in his best form, but he is capable of beating anyone. This was simply not his event. 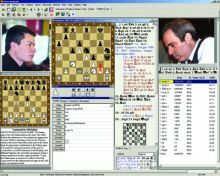 Watching the games was quite exciting for me, as there were so many decisive games, time trouble was always fun to watch, and seeing some new players come to our chess club (Rensch, Shahade, Diamant) was exciting. Hopefully we will have another similar event soon, and we can see if America’s talent can earn some norms.